In honor of Election Day 2016 in the U.S.A, we're celebrating three All-American destinations where visitors can visit historic sites that played key roles in the country's history and freedoms. From Philadelphia to Washington, D.C., here are three great places to discover. Founded by William Penn in 1682, this city played a key role in the founding of the country. During the American Revolution, Philadelphia was a meeting place for the Founding Fathers of the United States. Within Independence Hall, the country's founders debated and ultimately signed the Declaration of Independence (1776) and the Constitution (1787). Today, the Independence National Historic Park provides a hands-on history lesson, where visitors can see the Liberty Bell, as well as tour Independence Hall and the Benjamin Franklin Museum. Read more below. Tip: Spend the night across the street from the National Historic Park at the Hotel Monaco Philadelphia. 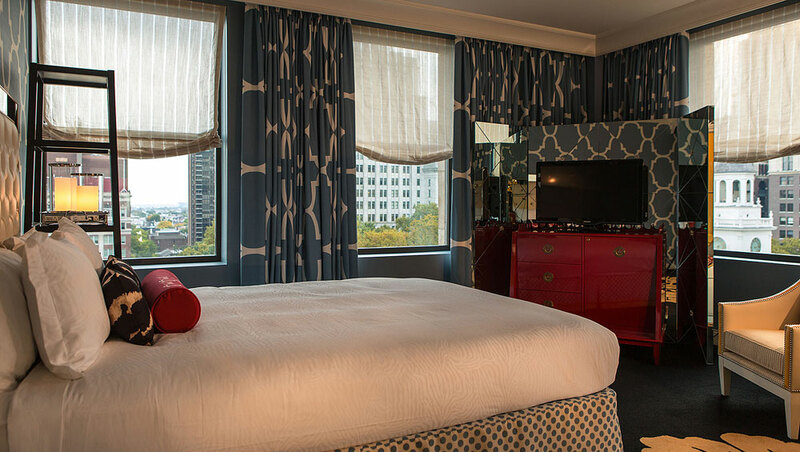 Set within the Lafayette Building built in 1906, the boutique hotel offers iconic views, rooftop lounge overlooking Independence Mall, and a chef-driven restaurant. "One if by land, two if by sea..."
One of the oldest cities in the U.S., Boston was the site of key events during the American Revolution, including the Boston Massacre, Boston Tea Party, and the Battle of Bunker Hill. From the east side balcony of the Old State House, the Declaration of Independence was proclaimed to cheering crowds by Colonel Thomas Crafts on July 18, 1776. Continue reading below the photo. Tip: Wake up to views of the Old State House at the Ames Boston Hotel. This boutique hotel combines a historic building with Romanesque arched windows and fireplaces, with modern design. Along the Freedom Trail, guest rooms have white marble rainshowers, hardwood floors, and large windows with historic views. The nation's capital city, there's a political point of interest on nearly every corner (or so it seems). From the White House lawn to the majestic National Monument, there are captivating points of interest. Spend the day exploring the Smithsonian Museums, take a tour of the U.S. Capitol Building, or discover the iconic Lincoln, Washington, Jefferson, and veterans memorials. Continue below. Tip: The Hay-Adams Hotel offers views of the White House and St. John's Church. Built in the 1920s as a residential hotel, the boutique property offers the feel of a private residence, directly on Lafayette Square. In the evenings, retire for a cocktail at the Off the Record Bar, a popular place to be seen (but not heard) by politicos and visitors alike.